In Jacksonville, more than 1,200 turkeys and nearly 4,500 pounds of nonperishable items were collected during the two-week drive, which ran from November 1 to 15. Locally, the Giving Thanks, Giving Back Thanksgiving Drive benefited Farm Share, Inc., a nonprofit organization that partners with agencies to distribute approximately 40 million pounds of food each year to families in need. David Weekley team members provided the collected items to Farm Share, Inc. to distribute to families in time for the holiday. Additionally, The David Weekley Family Foundation donated $4,500 to the organization. “It is one thing to get turkeys donated but it really hits home once you start handing them out to families and veterans that would not have had a Thanksgiving without the food giveaway,” said Dave Reynolds, a facility manager at Farm Share, Inc.
Farm Share Inc.’s mission is to alleviate hunger and malnutrition by re-sorting and packaging an abundance of surplus food and distributing it to individuals, soup kitchens, homeless shelters, churches and other organizations feeding the hungry in Florida. 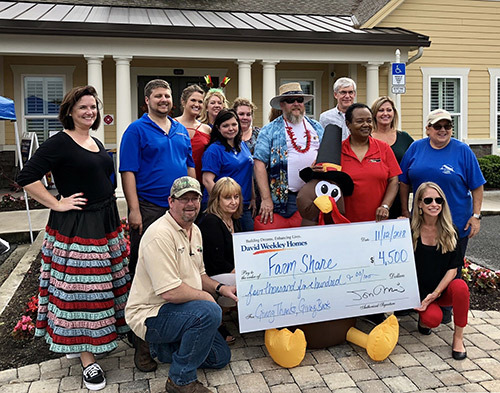 Team members from David Weekley Homes donated more than 1,200 turkeys and nearly 4,500 pounds of nonperishable food items to Farm Share, Inc. to benefit families in need.